I have no idea how they got there. I am syncing the Calendar app with Google, Facebook, and Meetup, but I can't imagine how that would produce such a ridiculous number. What can I do about these? I would like to delete or merge some of them but the app is not giving me the option. Is it possible to delete most of them without losing anyone's birthday? If I look at the Calendar app on my Mac (which is running Yosemite), I don't see all of these calendars. I only see one under Google that says "Birthdays", another under Google that says "Friends' Birthdays", and one under Other that says "Birthdays". EDIT: I did some looking around and it seems like the "Birthdays" calendar under Gmail has my contacts' birthdays and the "Friends' Birthdays" calendar has my Facebook Friends' birthdays. But all of those "Other" birthday calendars don't seem to have a single birthday in them. I think I can delete them safely without losing anything. I just need to know how, but I don't see any sort of option to delete them. I logged into iCloud using the iCloud website. I clicked on the calendar icon and all I saw was two empty calendars called "Home" and "Work". I did not see all the empty birthday calendars. I didn't see anything useful or meaningful, but I wouldn't expect to because I am syncing all of my calendar events with Google, not iCloud. I noticed that the "Other" birthday calendar I saw on my Mac didn't have any birthdays in it, so I deleted it. But I refreshed the calendars on my iPhone as described here and it didn't seem to do anything. I still see 8 "Other" birthday calendars. As Insomniac Software mentioned, the Birthday calendars come from the Contacts app. In the Contacts app, it (confusingly) launches at a page that shows an aggregated view of contacts from different sources. Tapping the "Groups" button at the top left of the screen takes you to the list of sources. On My iPhone. Birthdays in "Other" come from here. The problem is that, from what you've said, it sounds like your contacts are stored on your iPhone, not in iCloud - otherwise they would show up in an "ICLOUD" group, not an "On My iPhone" group. Select a place to store your contacts. I'll give an example for iCloud because I suspect your contacts were there and got dumped on your phone while changing settings. If you think you have them stored in gmail, post a comment and I'll update my answer. Move the contacts to your selected location. To merge them to iCloud: go to Settings > Mail, Contacts, Calendars > iCloud, turn on "Contacts". It should tell you "Your contacts will be merged with iCloud". Tap ok to allow it. Go back to the Contacts app, tap "Groups". You should see an "ICLOUD" group. It may take several minutes to sync - go get coffee and come back if you don't see it. You should not see an "On My iPhone" group. Now, you need to make sure your contacts are there. In the Contacts app on the Groups page, to see what's in a particular source, tap the boxes under each group heading until the checkbox is only on the one you want to see. So, to see what's in your iCloud contacts, there should only be a checkmark on the box under the "ICLOUD" group heading. Then, tap "Done" in the upper right corner to see the contacts - it'll only show the contacts in the selected source (i.e. iCloud). Close the app, wait 5 minutes, check again. If they're still there, continue. If they're gone, you're done! Go to Settings > Mail, Contacts, Calendars > iCloud, turn off Contacts. Tap "Delete contacts from my iPhone" (very important). Wait a minute for it to sync, then go check your Calendar app. The Birthday calendars should be gone. If they're not, give it a couple more minutes. If they're still not, turn your contacts back on anyway (next step) and comment. Go to Settings > Mail, Contacts, Calendars > iCloud, turn on Contacts to get your contacts back. Wait a minute, then go check your Calendar app. The Birthday calendars should still be gone. I managed to remove all birthdays event on my iPhone calendar. In iCloud and all my email account, I turned off calendar. Then I switch my phone off and on it again. All birthday events in the calendar are now gone. It seems since iOS 10 this issue (or at least a very similar one) has reemerged, duplicating 'Facebook' and 'Other' birthday calendars hundreds of time. The Other Birthday entries are collected from the Contacts, not from a Calendar. In the Settings > Mail, Contacts, Calendars screen, how many accounts do you have with Contacts enabled? It will create a Birthday calendar entry under Other for each account, even if there are no contacts with birthdays entered. It's a little strange, but I guess those birthday calendars are related to your iCloud account. Got to Settings > Mail, Contacts, Calendars > iCloud and turn off and on Calendars. This panel allows you to select which calendars will sync to your iDevice and iCal. Simply uncheck those you don't want in iCal or iPhone, and they will disappear from those devices, but remain in your Google Calendar list. If you want to know more about these Calendars, you should visit the Google Calendar site. Then select 'Settings' from the Gear icon on the right, choose the "Calendars" tab, and then view the calendars listed. For example, if you have Google+, Google 'helpfully' creates a Birthdays calendar from your Circles. Some calendars you can delete by hitting the 'unsubscribe' link, but others, including the Google+ Birthdays calendar, you can not delete (thanks Google). However, the sync link above will prevent them from showing on your Apple Device. if you turn off calendars, the birthdays should disappear. I just looked at my Calendar app and the empty birthday calendars are not there. I recently updated to iOS 8.3, and I can't imagine what else could have fixed it, so I'm guessing it was that. Since this issue came up again for me (and others) in iOS 10, and this post ranks so high in google, just wanted to mention that updated to 10.3 fixed it for me. Not the answer you're looking for? Browse other questions tagged iphone calendar ios . 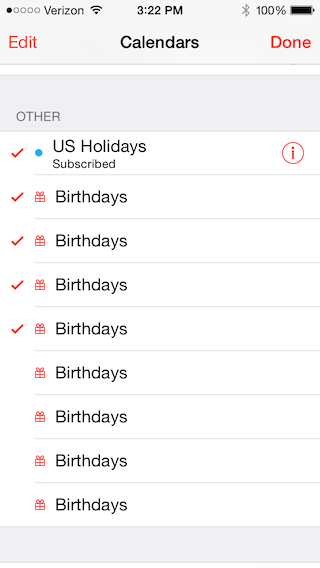 How can I hide **some** birthdays in iOS Calendar? How can I copy Facebook birthdays to my iPhone's calendar? How to remove Zombie birthdays from Contacts/Calendar?